The purpose of taking an Insurance Policy is so that you can get a claim. In the recent years, with the renewal of tariffs by the Regulator, the entire market has become sensitized to the Premium charged, with each corporate judging its insurance efficiency in terms of the premium reduction achieved. This mindless focus on the premium has resulted in every insurance buyer losing sight of the basic fundamental of insurance - coverage. Very often the entire exercise of insurance is completed so close to the renewal date that there is hardly any time to check whether the policy will actually deliver what the buyer really wants at that price. This causes problems at the time of claims, and the increasing litigations / rejections in claims are testimony to the sheer inadequacy of this approach. While others focus only on the L1 Approach, we focus on the A1 Approach - getting you the Best AND the Cheapest covers. No gaps in covers, no unnecessary fine print. Unfortunately, very often it is the mistaken belief of most buyers that by asking multiple intermediaries and multiple insurers to quote for their covers, they will get the lowest prices. This fallacious belief stems from the belief that all insurance covers and insurers are the same, and hence price is the only differentiator. This could not be further from the truth. 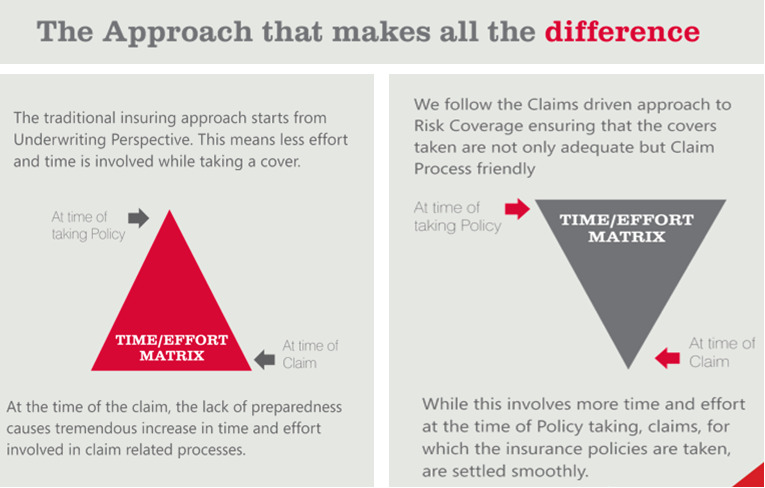 Every insurer has a different servicing paradigm which is continuously evolving. Every insurer has a Claims Philosophy that mutates. Comparing two different insurers or their products on price alone could be a fatal mistake. Work with the intermediary who gives you the most comfort. This comfort comes from the value and expertise he brings to the table on all aspects of insurance. Trust your intermediary to do a Gap Analysis/ Risk Evaluation so that you determine your exact insurance needs. Let the intermediary float the covers, and give you a Cost Benefit analysis based on the insurers who have quoted. Choose the right insurer for each cover. Some insurers may be better in a particular portfolio than others. Check your policies for correctness. Put in the right processes to check adherence to the policy terms / requirements.